Telephone: +267 310 5601 or 391 3111. The languid and life-giving Chobe River is both exceptionally beautiful and bursting with wildlife. Probably the best place in Africa to see elephants swimming, you'd also be hard pushed to find a better spot for an evening boat cruise and a sundowner or three with hippos belly laughing all about you. To take the experience to another level, book a Chobe houseboat holiday. Botswana's Moremi Wildlife Reserve lies in the centre of the Okavango Delta. The reserve encompasses a wide range of habitats – from wetlands, floodplains and reed beds to forests and savannah woodlands. The fauna inhabiting this pristine park is abundant and equally diverse, ranging from exotic birds, zebras, buffalo, wildebeest and giraffes to hippos and lions. Encompassing ancient animal migration routes between Botswana and South Africa, this enormous desert park is bigger than the Netherlands and famed for its big cat population, particularly lion and cheetah. Other attributes include incredible night skies and overpowering stillness. It's still a relatively underexplored park, and a special place for wild camping. Chobe National Park is Botswana's flagship park and easily combined with a visit to Victoria Falls just across the border into Zimbabwe or Zambia. The park itself is vast, wild and home to more than 100,000 elephants, sometimes seen in herds of up to 500. There are also plenty of predators, including leopard, lion and the critically-endangered African wild dog. The oasis of the Okavango Delta is one of Africa's most iconic destinations and not without good cause. Positively teeming with wildlife and birdlife, this region of vast grass flats, low tree-covered ridges and narrow and intricate waterways is best explored in a mokoro, a traditional dugout canoe. This rustic means of transport takes you closer to the delta's staggering biodiversity. Traverse the world's largest salt pans on a quad bike to make the most of the awe-inspiring vistas and sense of isolation. Come at the right time of year and you'll also see southern Africa's most spectacular zebra and wildebeest migrations. The barren landscape is occasionally punctuated by strange and picturesque islands of palm trees. You might spot the rare brown hyena here. Established in 1992, this community-based wildlife project is a shining example of Botswana's sterling conservation work and its emphasis on sustainable tourism. The peaceful sanctuary provides a safe haven for both white and black rhino, previously wiped out across most of the country, and there are onsite chalets and camping facilities. Tsodilo Hills is a UNESCO World Heritage Site held sacred by Botswana's San Bushmen. Known to have been inhabited for at least 100,000 years, these dramatic, isolated hills are decorated with thousands of fascinating ancient rock paintings. A number of different hiking trails showcase both the stunning natural beauty and rich cultural heritage of these ancient landscapes. 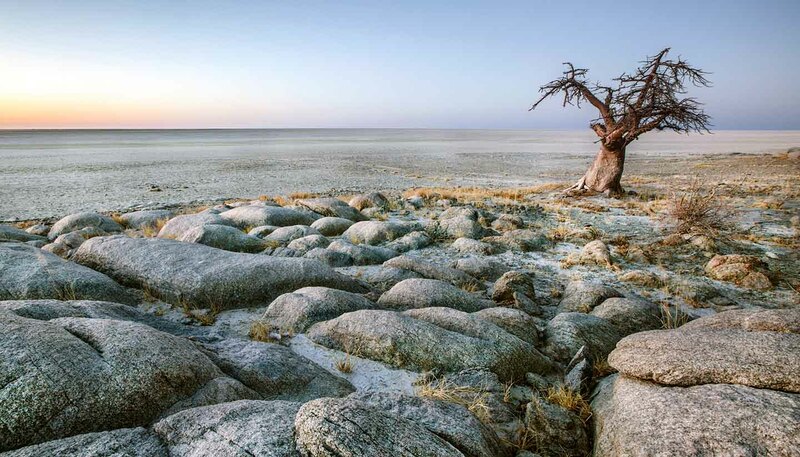 Remote, enormous and virtually unexplored, the Central Kalahari Game Reserve is a refuge both for iconic wildlife and the country's few remaining Bushmen, nomadic hunter gatherers indigenous to southern Africa. Often referred to as one of Africa's last true wildernesses, roaring lions may be the only sound to puncture the overpowering desert stillness here.